This is the same key as the CH751 key. The only difference is the oval shaped black molded head design. Various products with keys stamped CH751. Information found above is to be used as a GUIDE ONLY. Although the applications shown above will fit those that are listed, there may be similar models that use different key blanks. To ensure you buy the correct key blank, we strongly recommend comparing groove patterns of your current key against the image shown above. 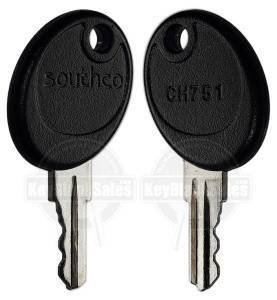 This key is made by Southco. Various key blank manufacturers may call this key by a different part number. Precut keys, purchased through this site, are sold with the understanding that they are for your personal property or equipment. If these keys are not for your personal property or equipment, DO NOT BUY THEM. We are not responsible for those who use these keys in an unlawful manner. We capture I.P. addresses for security purposes and will pursue legal action against those who disregard this policy.